29" x 24" x 8.5"–5.5"h. (tapered), 9 lbs. 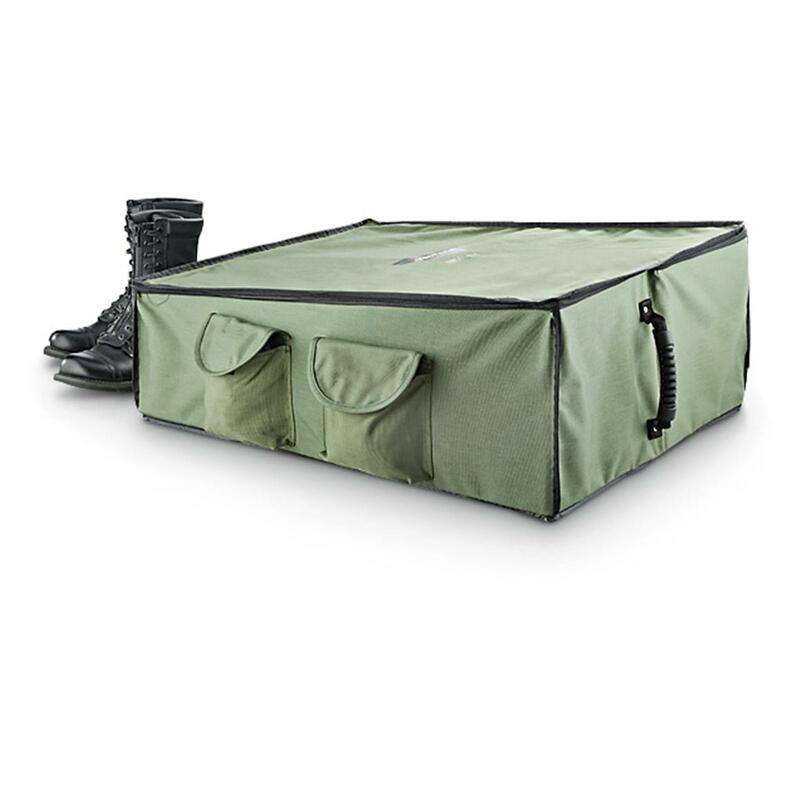 This Disc-O-BedTM Foot Locker delivers powerful storage and organization to any compact under-bed or closet location. 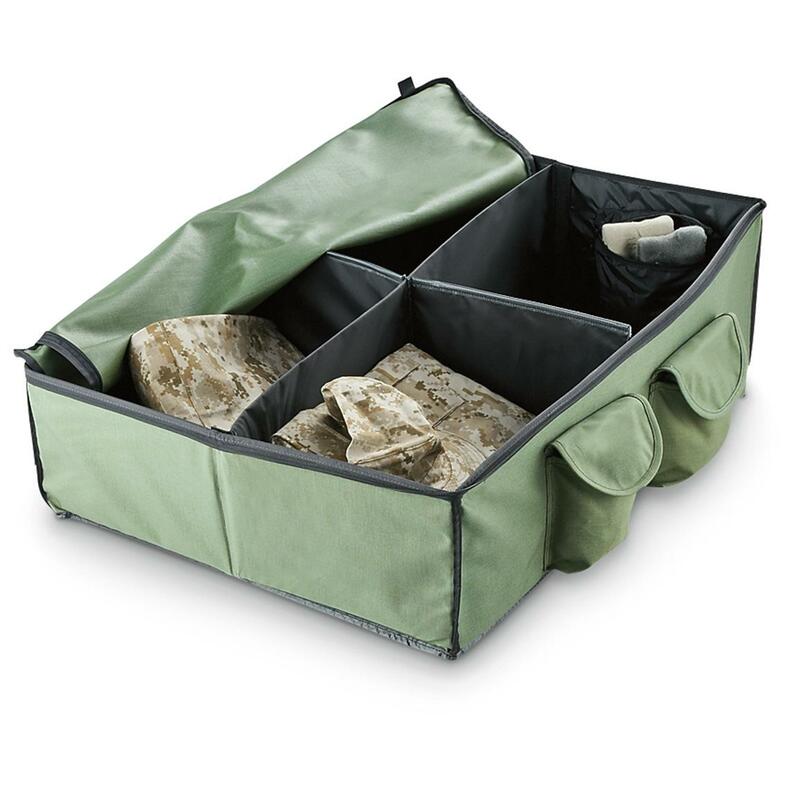 Multiple compartments hide inside a lockable interior, with more pockets outside to keep quick grab-n-go items in easy reach. Guard clothes and equipment against spills, rain and more. U.S. Military Surplus Disc-O-Bed Foot Locker, New is rated 4.3 out of 5 by 6. Rated 5 out of 5 by steviebenoit from NICE Just received storage box today. Well made and very kool. Folds up nicely when not in use. Sturdy material and good zippers. A bit tall for under bed. Rated 4 out of 5 by CRAIG from Worked as indicated. Smaller than expected. Rated 5 out of 5 by MICHAEL from This is a great locker/box and it saved me a lot of space. It is pretty big and I put a lot of staff inside. Now I have just one nice box instead of 10-15 small shoos boxes. Rated 5 out of 5 by GARY J from Very nice and functional. Will help keep the tent neater on camping trips. Each measures 4"h. x 3.5"w. x 1"d.
4"h. x 3.5"w. x 1"d.
19" x 19" x 12", 16 lbs.